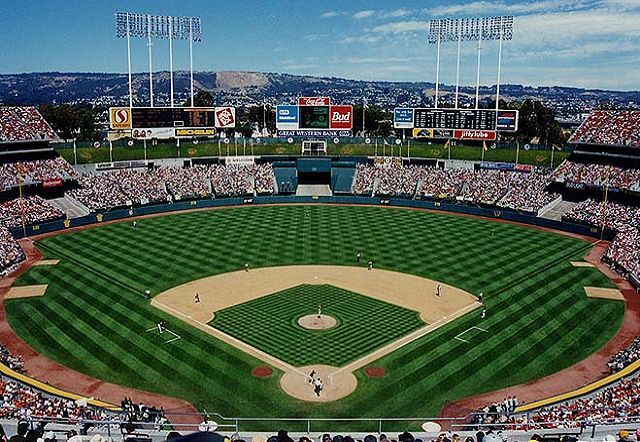 I used to love the way that the "Oakland Alameda County Coliseum" rolled off the tongue. Lot better than Network Associates or McAfee. Either way, here is a photo of the OACC in 1965 while under construction. The adjacent basketball/hockey arena was also under construction at the same time. Possible final Raiders game was played Christmas Eve. Watched. Field was brutal due to the rain. Anyone know why some grass was like a lighter green? I know the field was sod patched, but the light green areas were not in sod piece sizes. Almost looked like an invasive grass within the grass on the field. Was thinking that the field crew maybe used one of those sod stitching machines that grafts synthetic turf blades into the sod to help fortify the surface. The turf looked like it was coming up in chunks sometimes but not as bad as I'd expected. I know the Radiers are in limbo for the 2019 season. With the upper deck of Mt. Davis being permanently covered; think they'd demo the top off? Maybe leave the suites. I can't wait to see the place restored back once the Raiders leave. Is that possible? Or is the place remaining as is with the A's in limbo too? It will always be Oakland Alameda County colosseum to me. I wish corporate naming of stadiums would go the way of the dodo. I had three homes as a kid from 8-17 . . . 1 my home 2 OAC 3 The Stick. I actually grew up to adore the A's history in Philly and ole Connie Mack . .. and the Giants and theirs at Polo Grounds . . . I've often studied those . . . with no attention to my old home . . . that's merely the way life is. I agree . . . always and forever . . . Oakland Alameda County Colossem with ole Monty Moore spoutin' . .. "Come on down tonight folks to see the swingin' A's . . . and their one million dollar scoreboard which Charlie O put up last week . . ." . . . oh I miss those old days of the A's. My old days, not someone elses. Anybody heard anything about the prospects of a new park for the A's now that the Traitors have "finally" moved to Las Vegas? newballpark.org – The never ending quest for a proper home for the Oakland Athletics. New Yankee Stadium has worst stadium in MLB on perma-lock, partially because it stinks and the rest because as a result of it's existence what was left of the real Yankee Stadium was destroyed. Just for clarification, I assume you are referring to he 1974 destruction of "real" Yankee Stadium. How many years running is this "The Worst Stadium In MLB"? As many years as the A's have played there. My friend singing Anthem at Oakland--she's done it 7 different years. 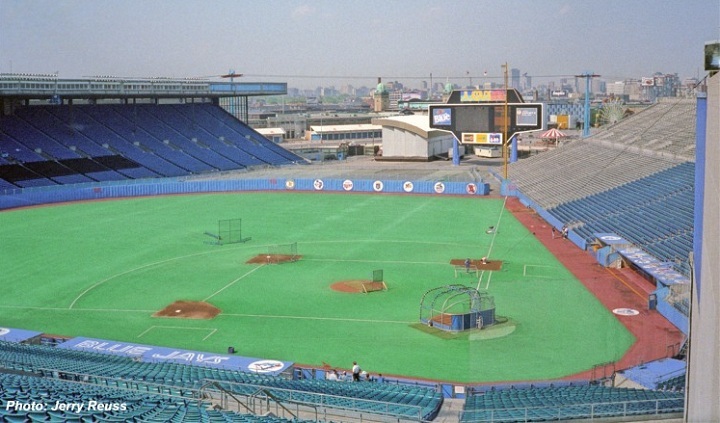 ... and the Jays have played at SkyDome. Put a replica of Shibe Park in Jack London Square site. The shorter power alleys and Death Valley in center field will increase both homers and triples, which makes it exciting for lovers of the long ball and of sliding plays at 3b and home plate. City of Oakland should tear down Mt. Davis just for spite, let Raiders play without it for 2 years. Athletics don't need it, and Raiders won't either. I can't see the Raiders hanging around for 2 lame duck years. Maybe if newspapers and other media refused to use these sponsor names in their stories, thus providing free advertising, these naming deals would be less valuable and they would go away. Just refer to the venue as A's Stadium or Met's field etc. in the stories.